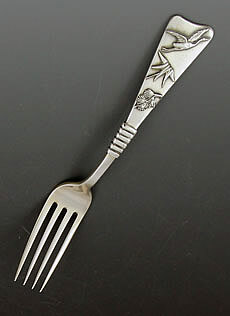 An antique sterling silver youth fork by George Shiebler with applied Japanese motifs including a crane and other Japanese plants and leaves. Satin finished handle. A sterling silver hammered spoon with applied copper and gold washed leaves. The entire surface is hammered. Length: 9". Weight: 3.6 troy ounces. Gold washed bowl. A good Gorham antique youth spoon measuring 6 1/4" long with a wide gold washed bowl, hammered handle and an applied copper chicken and silver granules beneath the feet of the chicken. Inscribed and dated 1885. 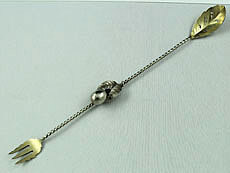 An antique sterling olive fork and spoon by Gorham with applied leaves and olive on a twisted handle. Pierced gold washed satin finished leaf form bowl. 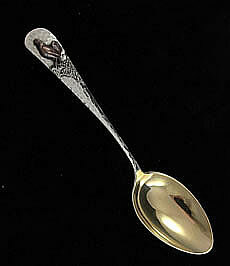 An antique sterling silver spoon by George Shiebler with applied Japanese motifs on the handle. Monogrammed on the reverse of the handle and dated 1886. Length: 9 3/4". Weight: 3.85 troy ounces. 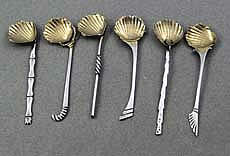 Set of Six rare Gorham 334 sterling silver coffee spoons in excellent condition with original gilding and hand crafted handles. Length: 4 1/4". Circa 1880. 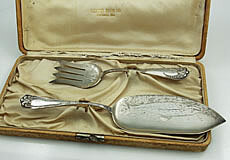 A two piece sterling silver fish serving set by Frank Smith with engraved blade and tines. The quality of the engraving is quite special and the fish is very realistic. Please view the pictures by clicking on the picture for details. Combined weight: 7.85 troy ounces. Length: 12" and 9" respectively. Monogrammed on the front of the handle. In the original box. 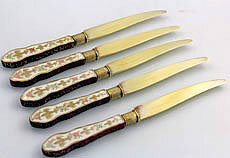 Five unusual Gorham sterling silver gold washed fruit knives with Dresden enamel porcelain handles. The front and back of the porcelain handles have gold fleurs de lis and pink and blue flowers. The sides are burgundy and gold. The blades are marked Gorham M'f.g. Co. Length 8". 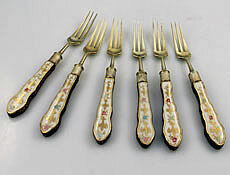 Six Gorham sterling silver gold washed fruit forks with Dresden enamel porcelain handles. The front and back of the porcelain handles have gold fleurs de lis and pink and blue flowers. The sides are burgundy and gold. Marked lion, anchor, G, Sterling on the back of the tines. Length 7 1/4". 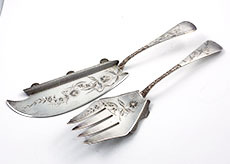 A two piece fish serving set retailed by Ball Black of New York and patented 1867. The blades and tines are engraved and pierced. This pattern is listed in Turner as a Whiting pattern called Gibney. Combined weight: 8.9 troy ounces. Length: 12 1/8" and 9 1/2 (fork). Never monogrammed. Magnificently engraved blades. 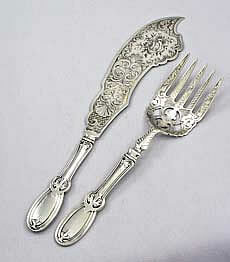 Two piece sterling silver fish set circa 1880 finely bright cut and engraved measuring 13 1/4" and 12" respectively. Additional fine hand hammering on the handles superimposed with Japanese style engraving of bamboo and blossoms. Retailed by Caldwell. Weight 11.8 troy ounces. 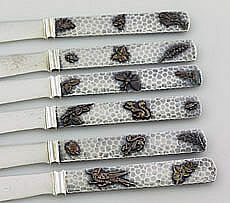 Six knives with hand hammered handles containing copper applications of bugs and other Japanese motifs on both sides. Circa 1880. The blades are all silver and are marked with the logo and the Dominick and Haff mark. Length: 7 7/8" . Combined weight: 11.4 troy ounces. 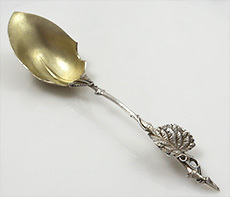 An antique sterling silver almond scoop by Wood and Hughes of New York in pristine condition with original gilding in the scoop shaped bowl. 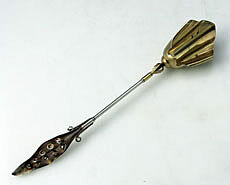 The handle is a cast leaf with cast and applied lily of the valley. There is some additional applied cast leaf decoration on the handle. Circa 1870. Length: 8" Weight: 1.05 troy oz. 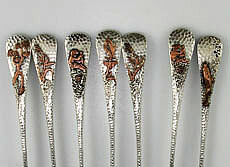 Seven Gorham sterling silver hammered cocktail forks applied with copper and silver decoration. The applications include fish, cherubs, plants and butterfly mostly Japanese influenced. length: 6 1/8". Four monogrammed. 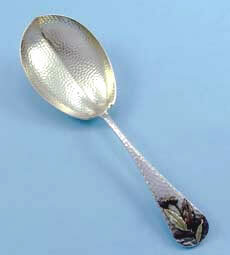 Large sterling silver fruit scoop by Wood & Hughes with a naturalistic branch handle with vines and applied leaves. The bowl is gold washed and satin finished. Never monogrammed. Length 11"; weight 3.25 troy ounces. 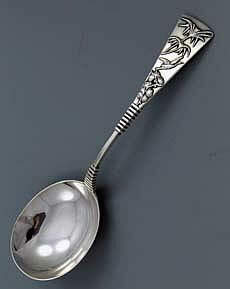 A Gorham sterling silver youth spoon engraved "Marjory" , circa 1870. Applied copper bird and leaves with applied silver sand on the front of the handle. Marked with the Gorham mark and Sterling and other metals. Gold washed bowl. Length: 6". Weight: .85 troy oz. 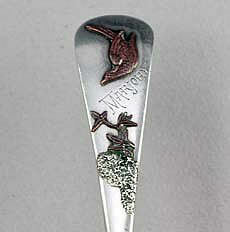 A Gorham sterling silver shovel in the Lady pattern monogrammed with a script letter in the center of the bright cut decorated disc applied to the handle, decorated with a cast bow. Circa 1867. Marked on the back of the handle which also has a female hand at the junction with the bowl. Length: 10". Weight: 2.95 troy ounces.